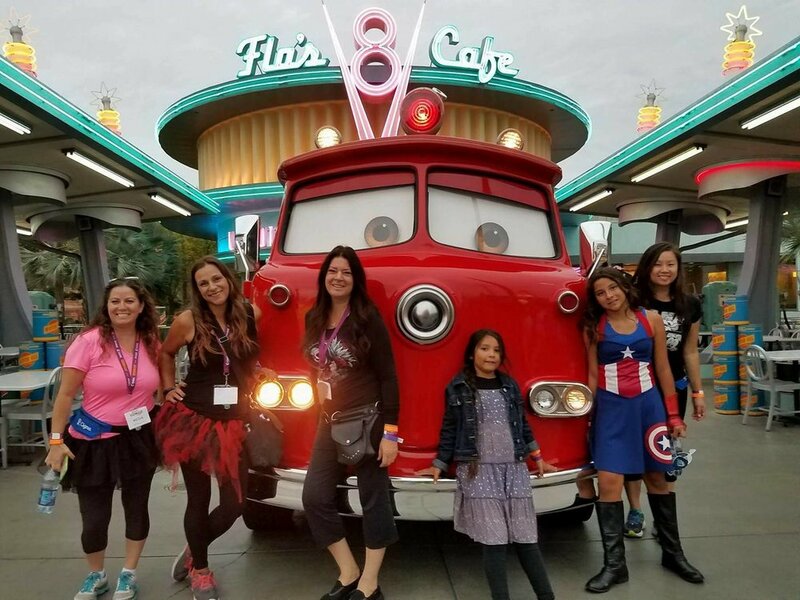 My Top 3 Takeaways from CHOC Walk in the Park & Why you should walk too on August 27th! Having a child with special needs you tend to not take for granted the little and ordinary things your child accomplishes. Seeing your child initiate play with a peer, knowing how to engage in a simple conversation with a classmate or self regulate themselves enough that they are not perceived as strange. These struggles are nothing in comparison to the fights some parents face when a child becomes terminally ill. I am beyond grateful for my girls health everyday and her accomplishments in spite of her autism. I was honored to be included in last years CHOC Walk in the Park, I've always wanted to participate but up until a few years ago it wasn't even an option as my daughter was just completing her therapies and still learning to comprehend social settings. This year was our year! I was given the chance and we did it together. A few years back she would not have understood going to Disneyland and not be able to ride the attractions and leave the park without doing so. Our dedication made our walk possible and I was so proud of my girl for making it through the entire event, we ended up walking over 7 miles. 6 a.m and ready to start the 5k walk in the park! As we began the walk, I was hit with the memories of how much Disneyland has helped my child learn and grow in public, it went from our ABA reward to our happy place with no strings attached. Seeing the crowds and the children and the families that were there in memory of those that couldn't be was very moving. It really makes you all the more grateful for what you have in your life. So what did I take away from our walk for choc walk in the park? To be grateful for what you have, there is always someone dealing with something far more worse than you are. Love your children with all your heart! Tomorrow is never promised and they are only little for a short time. Be kind, for you never know what battles others are fighting. Around the half way point in DCA, the gang is going strong. What is CHOC Walk in the Park? It's their annual fundraiser and a chance for families to give thanks to the fine doctors and nurses at the hospital while sharing their common connection with other CHOC families. This will be the 27th year the 5k walk will be held and if you have never participated, here is what you can expect and how you can help. Walkers needed to raise a Minimum $85 to participate in this years event which benefits the care of children, research and educational programs within the community. Since 1990 CHOC walk has raised over $26 million as of 2016. This years ambassador is Nine-year-old Jordin Jackson. Read her incredibly emotional and inspiring here>> https://www.chocwalk.org/Static/2017-Walk-Ambassador. At the finish line! So proud of her! The route changes yearly and the support along the way is one that will fill your heart! We had an amazing morning seeing and stopping for pictures with so many of our favorite characters. I left with a sense of accomplishment, feeling of community and a heart swollen with pride in my daughter. The rain held off throughout the entire event and the overcast sky's made for perfect walking weather. Opening Ceremony: Main Street U.S.A. The Mickey & Friends tram will not be running - allow time to walk to Main Street U.S.A. Participants needing assistance to main gate can utilize special marked vehicles provided by Disney®. I honestly can't wait for this years walk in the park, I will be there with my girl bright eyed and ready to go! Many thanks to CHOC for all they do for our children and to Disneyland and Downtown Disney for hosting a magical time in the park.